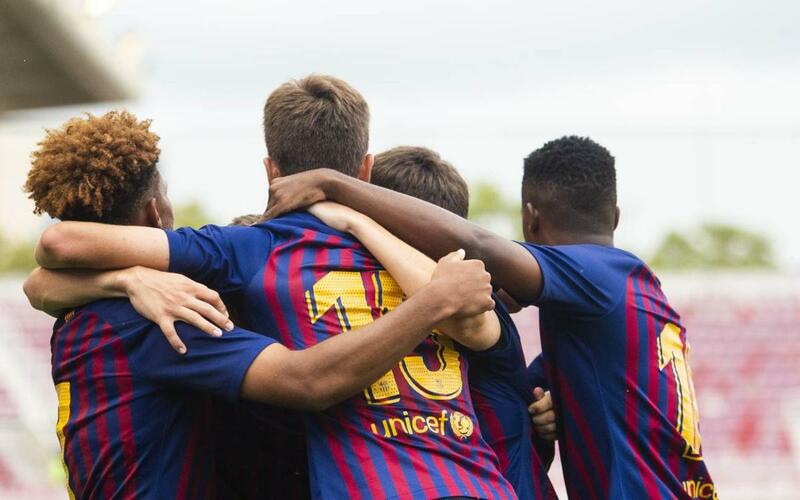 An 88th minute goal from Nico González saw Barça’s U19's edge Ruud Van Nistelrooy’s PSV youngsters (2-1) in the UEFA Youth League at the Miniestadi. Denis Silva had watched his side suffer at various stages of the match, though they also dominated at times themselves. The game began with two early chances for PSV, but Tenas was equal to them both. Lucas de Vega put the hosts ahead following Barça’s first real move of note, and thanks to a great pass from Nils on the left. That opened up proceedings and allowed a youthful Blaugrana side to dictate the pace. In the 22nd minute, Barça almost doubled the lead, but Van Dorp stopped Konrad's shot. It was then PSV’s turn to press with Tenas working overtime to keep the Dutch team at bay. The goalkeeper was very brave in the one on one’s and denied PSV with a spectacular save before the break. Two minutes into the second half PSV were level thanks to a Konrad own goal, and just afterwards, Piroe’s delightful mazy run almost saw a second for the visitors. Ihattaren also fluffed his lines in the 58th minute when well placed. The action was end to end at that point, until Nico González settled matters with barely two minutes on the clock.